BRAND NEW, MAGNIFICENT AND LUXURIOUS. 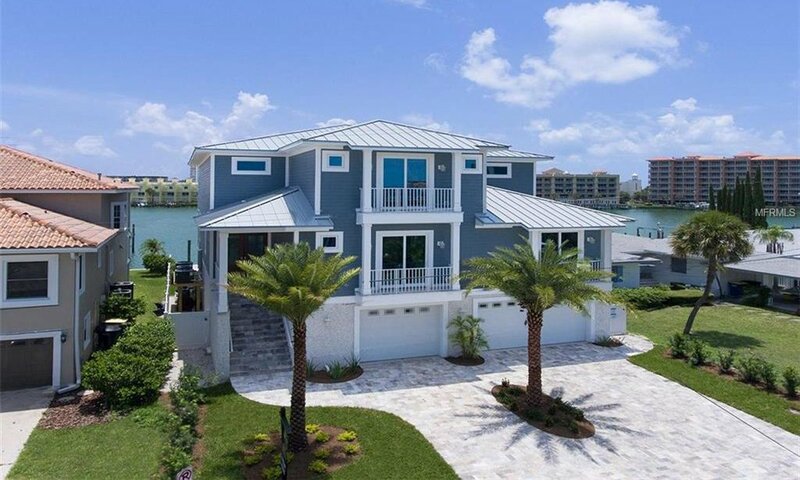 THIS REMARKABLE COASTAL CONTEMPORARY WATERFRONT ESTATE IS A SHORT WALK TO THE RENOWNED POWDERSOFT SANDS OF CLEARWATER BEACH! Exceptional high quality construction & extraordinary attention to detail yield this uncommonly 9205 total sqft home with rare 10-car garage parking & rapid deep water boating access to the Gulf. Beyond the timeless Coquina/Hardy Brd exterior, discover high coffered ceilings, graceful wainscoting, hand scraped oil-rubbed birch floors, rich woodwork, radiant chrome/glass lighting & a great room overlooking the waterfront. Open concept gourmet kitchen boasts “super white” quartzite counters, custom cabinetry, large wrap-around breakfast bar, center island, Subzero/Wolf appliances & fine casual waterfront dining. 3 spacious, south-facing covered waterfront decks provide dramatic evening views & endless entertainment possibilities. All bedrooms are oversized & lavishly en suite w/sumptuous private baths - 3 suites are effectively master suites in size/form/function. Master offers plush dual closets & a scintillating Carrara Venato Marble bath w/brilliant walk-in shower & microjet spa tub. You’ll love the elegant full-size laundries on each living level. Out back, enjoy the Azek dock, stunning heated pool/spa w/large sunshelf & multi-color lighting. 3-stop elevator, large formal dining, instant hot water, dedicated pool bath & so much more. A singularly inspiring waterfront living experience! Brand new construction with builder home warranties. Listing courtesy of CENTURY 21 JIM WHITE & ASSOC. Selling Office: FUTURE HOME REALTY INC.